If you take the tram number 15 you will soon be at the Jerónimos Monastery, a building started in the 16th century. Manuel I ordered to start the construction to commemorate Vasco da Gama's successful return from India. It is said that Vasco da Gama and his men had spent the night in prayer, in an hermitage that was there, before departing for India. The Monastery has got Manueline, Renaissance and Gothic style and motives. 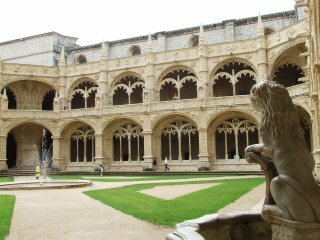 In the Jerónimos Monastery are the tombs of Vasco de Gama, Luis de Camões and Fernando Pessoa. The entrance to the Church is free, to visit the square cloister of the monastery, the refectory and the choir 4,50€. 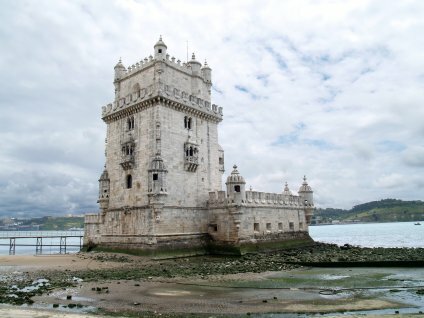 We can go toward the Padrao dos Descubrimentos and Belém Tower through an underpass. This tower built in a Manueline style of the 16th century is one of the most visited monument in Portugal. It was long ago situated in the middle of the river. Nowdays it is situated in the rigth border. The tower has been a defensive fortress, a custum building, a jail and even was used as a lighthouse. This monument that pages homage to the discoveries, was built in 1960. We can have an idea of what Discoveries mean to Portuguese history. It is 52 metres height and as we have said is an homage to Discoveries and to all the people who took part in it. 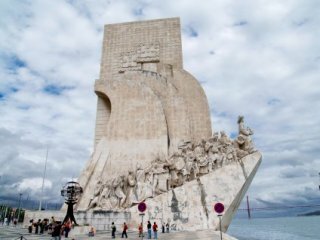 Inside this monumento there is a lift that climb to a six floor heigth, throuth the stairs you can reach the terrace and the view is a must.